I really don’t know where my obsession with lighting comes from. You can only have so many lamps in your house, yet I keep finding ones that I want. This morning I had an email from Smart furniture in my inbox that was filled with sale items. 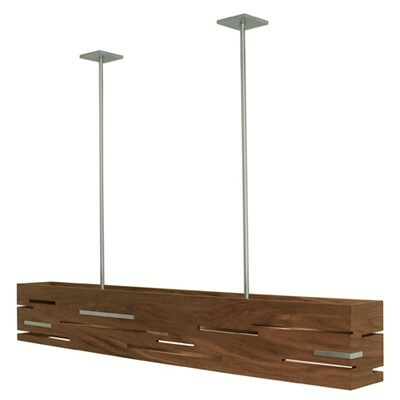 One of those items was the Aeris pendant lamp from Cerno. Right now above our kitchen island we have three individual pendant lamps, and while they look just fine, they are nothing compared to this. Aeris comes in two sixes; 30″ and 54″. 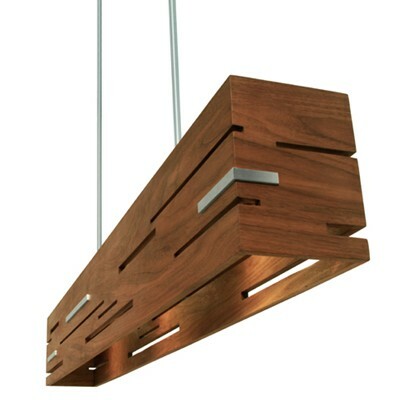 The walnut and metal pendant lamp was designed by Frank Carfaro and features a hand finished oil stain. The lamp is fully dimmable. The lamp features thin slits in the vertical walls f the light allowing the LED light source to cast filtered light to the sides as well as project light down onto the surfaces below. Aeris is hand made in Laguna Beach, California. The fact that it is made right here in the USA is another plus. Other perks are the light output of 1075 lumens, while only using 16 Watts. Posted in Design and Art, Lighting and tagged Aeris, Cerno, Furniture Design, Industrial Design, Laguna Beach, Lighting, Lighting Design, Made in America, Smart Furniture on July 1, 2013 by Author. ← These Facts are Barking Good.